When time permits and the stars are aligned just right which happens less and less these days I head over to Pastures Pharmacy. It truly is the Mecca for all wet shavers to visit. I’ve never seen so many shaving products in one place or like-minded people for that matter like Dave Flores whom I met when I was there. We talked about products we tried and thinking of getting until Leon the owner told us about a package he just received from Sudsy Soapery. They had been sent samples of shaving soap and told us to go through them and pick out the ones we liked. Dave and I made a makeshift table and starting looking at the samples. I managed to get 4 shaving soaps Almond & Vanilla, Sandalwood & Myrrh, Lavender & Peppermint, Twice Mint and one shaving oil in Lavender & Peppermint. Since we have samples it was pretty standard plastic container with a snap on lid except for the labels. I found them extremely hard to read because of color combinations dark background colors with dark text over them not the best choice of color combinations when resized for the smaller packaging but I understand they want to be consistent to the larger offering. The scents on these are just outstanding. The one that jumped out to me was Twice Mint it has peppermint and spearmint hence the name twice mint. This one is what the review will be based on. The scent is spot on for the double mint chewing gum which is a big hit for me so if you’re not a fan of that scent then this one not for you. The strength of the soap is on the high side of the chart but not over powering. 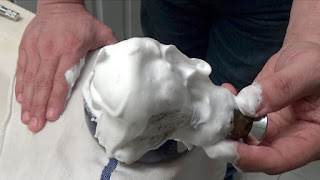 I bowl lather and placed the entire sample portion into the bowl and in no time created a lather that was thick and creamy with a slight increase in scent as a bonus. The lather was able to penetrate my 5-day old beard with ease. The slickness and glide are also tops and allowed me to go over areas with my razor with no irritations at all. My post shave feel was a good one a very close shave was had. So, I had a great shave with Sudsy Soapery I definitely recommend this great performing soap. The soap next in line for me to try would be the Almond & Vanilla this one is just as outstanding.